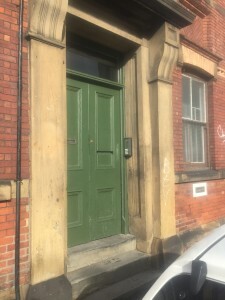 We are located next door to Go Outdoors (formally CCC’s) near Brammel Lane, opposite Armando’s Scooters, to gain access hit the button ‘Sheffield Hackspace’ on the intercom by the green double door. If you are in any doubt or having trouble finding us give the Hackspace mobile a ring on 07956 464 173 and one of us will gladly assist. If it’s your first time coming to the hackspace, we suggest coming along on a Friday evening between 1800 & 2100 as this will gives us an opportunity to give you a proper tour and answer all your questions. But check the calendar, just in case we had to cancel the session. The hackspace is very well served by public transport. Our nearest train station is Sheffield and is within a 20 minute walking distance. The nearest tram stops are Granville Road and University of Sheffield, but neither are particularly close. There are a number of routes that run down Bramall Lane (18, 19 & 252), however the bulk of local buses run down London Road (20, 43, 44, 51a, 75, 76, 86, 97, 98 & 798). Additionally, if you are coming in from Rotherham (a number of members do), you will want to consider the X1 which comes from Maltby (through Rotherham, Meadowhall, Attercliffe & etc) and terminates at Moor Market (about 700m away). The hackpace is located on a yard where you can secure your bicycle. There is a limited amount of local street parking available on Randall Street, Hill Street (one side is permit only) and Harwood Street. We also suggest that if you are coming in on a Sheffield United home game day, that you consider taking public transport as Randall Street will normally be closed by the police (for away team coaches). And, other local parking will likely be filled to capacity. The hackspace moves the Saturday events so that the minimum number of Saturday sessions clash with Sheffield United home games. But sometimes there will be the odd clash which we cannot avoid. Plus, there are FA Cap games which are not scheduled at the start of the season and cannot really be avoided. Please read signage when parking and (if necessary) getting a relevant ticket for parking. The hackspace is not responsible for any parking fines incurred. Also, the hackspace is not responsible for any damage to your vehicle incurred while parked on the public street.